Every evening at five o'clock, Christina and Rudy stopped work and began the ritual commonly known as Happy Hour. Rudy mixed Christina's drink with loving precision, the cavalier slosh of Bombay Sapphire over ice shards, before settling across from her in his Stickley chair with his glass of Scotch. They shared a love of language and music (she is an author, he a composer, after all), a delight in intense conversation, a fascination with popes, and nearly thirty years of life together. What did I think, that we had forever? muses Christina, seven months after Rudy's unexpected death. While coming to terms with her loss, with the space that Rudy once inhabited, Christina reflects on their vibrant bond -- with all its quirks, habits, and unguarded moments -- as well as her passionate sorrow and her attempts to reposition herself and her new place in the very real world they shared. In this literary jewel, a bittersweet novel of absence and presence and the mysterious gap between them, Gail Godwin has performed a small miracle. In essence, Evenings at Five is a grief sonata for solo instrument transposed into words. Interwoven with meditations and movements, full of aching truths and a wicked sense of humor, it exquisitely captures the cyclical nature of commitment -- and the eternal quality of a romance completed. "With deep truth and immediacy, Gail Godwin illuminates and indivisible marriage -- its experience, passion, thought, and wit; and its sundering into loss, longing, and remembrance.For such closeness, there should be a word beyond love." 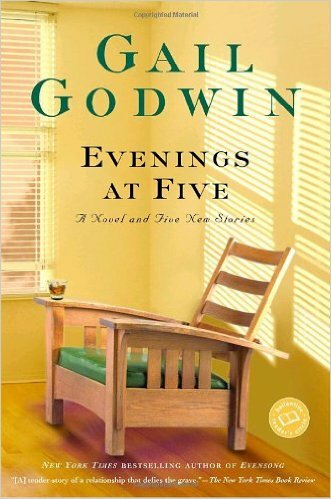 "If asked to list my ten favorite American fiction writers, Gail Godwin would be among them. In this, her latest -- but is it a fiction, or a memoir close to her own bone? 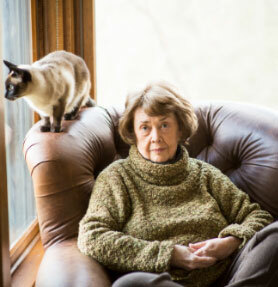 -- she evokes in a short book the long married life of two artists. Evenings at Five is a strong tale of love-after-death." "An unflinching account of love, loss, grief and the struggle toward consolation. It should touch every reader with its emotional power." "Gail Godwin has written a book about the heaviest matters of loss, grief, and loneliness with a touch so light that I was as often deeply amused by it as I was deeply moved." "A fierce evocation of what -- at some time or another -- everyone is bound to endure . . . An amazing little volume that contains an explosive emotional wallop." "With words alone, Gail Godwin has created an important piece of music about a love which death can only increase and deepen. Yes, and Frances Halsband’s illustrations are a haunting countermelody." "Evenings at Five reads like a novel, but it's a fictionalization of a real event. 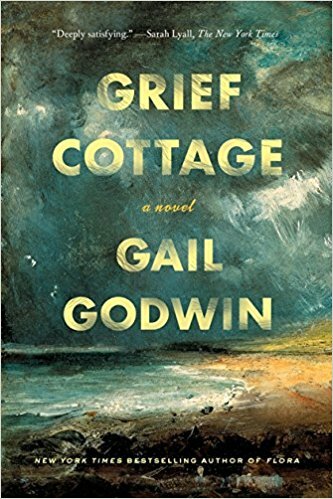 Gail Godwin uses all the weapons of art to deal with her own all-too-real grief, and the result is a rigorous exercise in restraint, control, irony, memory." "A little masterpiece . . . dexterous, strongly felt, multi-level writing." "[A] heartrending book . . . Brilliantly webbed scenes fill its pages . . . Godwin writes with enormous clarity and unvarnished prose. She writes, in other words, not to approach the truth but to forcefully ascertain it." "Possibly her truest book . . . There is a quiet dignity here that puts you into the two people's lives . . . Full of wicked humor and sage and subtle advice, laced with achingly familiar refrains of love and loss, Evenings at Five could well restore a bereaved man's or woman's sense of self." "An exquisite portrait of a thirty-year relationship . . . There is a depth and intensity within that many large tomes never capture . . . just as Christina ultimately knows she has to move on, one assumes Godwin needed to write Evenings at Five to move on and work on another outstanding novel." "Quirky, wry, and surprisingly powerful . . . with a delight in words and the ways people use and abuse them that is typical --- of this urbane author." "The New York Times bestselling author of Evensong has scored again . . . The novel, which can be read in one sitting, is an excellent showcase of Godwin's talent. Those not already Godwin fans are apt to be converted." "The most balanced, heartrending book you ever read on the nature of loss, loneliness, and grief." "No one does the nitty-gritty of soul-searching like Gail Godwin . . . [She] is one of the few contemporary novelists willing to tackle the ticklish (to modern writers) topic of religion in real life. In a novel inspired by her own experience, she does it again, beautifully." "Godwin accomplishes more in this smart, arch, and charming little illustrated novel than many of her peers do in far heftier volumes." "Gail Godwin has put into words a subtle love story that enriches us all, sharing that which we all feel when we lose the love of our lives. Thank you."